A few weeks ago, my friend Kayte and I decided to try a recipe from Nick Malgieri‘s new book, Bake! She chose Orange & Almond Scones. I had all the ingredients on hand, including almond paste, which I had recently purchased for another recipe. It had taken some searching to find the almond paste, and, as you know if you’ve ever bought it, it was quite expensive. In the process of hunting for it, I had come across a number of recipes for homemade almond paste. After paying nearly $6 for a small can of it, I decided making my own might not be such a bad idea. Make a sugar syrup by placing the water, sugar, and corn syrup in a saucepan. Stir it to combine. Bring it to a boil and let it boil for a few moments. Let it cool. Place the almonds in a food processor and process them to a fine powder. Add the powdered sugar. 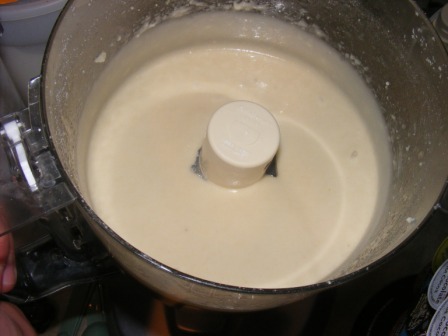 With the food processor running, slowly add the sugar syrup until the mixture forms a paste. Store the almond paste tightly covered. If you will be storing it for more than a week, store in the refrigerator. This recipe came together easily, at least until the end. Evidently, when the recipe says, “add the sugar syrup until the mixture forms a paste”, it means to add it just until it forms a paste. I added all the sugar syrup and ended up with something the consistency of tahini paste. Way too thin for almond paste, although the taste wasn’t bad. Place almonds in a food processor; cover and process until smooth. Add the confectioners’ sugar, egg white, extract and salt; cover and process until smooth. Divide almond paste into 1/2-cup portions; place in airtight containers. Refrigerate for up to 1 month or freeze for up to 3 months. This was also a quick and easy recipe, and the taste was far superior to the sugar syrup version, owing mostly to the almond extract and salt. I had never used almond paste before, so I decided to open the can of paste to see how it compared to the homemade versions. The taste and consistency of the egg white paste was closest to the canned version. I actually liked the homemade version better, as it had the most “almondy” flavor. I remade the sugar syrup version, this time adding only enough syrup to get it to a similar consistency to the egg white version. I also added salt and almond extract to the recipe, which improved the flavor considerably. At the end of the day, I prefer the egg white version over the other two. The canned is my second favorite, with the sugar syrup version landing up on the bottom of the list. Since I can buy slivered blanched almonds at Mr. Bulky’s pretty inexpensively, and it’s really easy to mix up, I doubt that I’ll buy almond paste again. I just tried these: a great lifesaver when I had already started the macaroons recipe and realized I didn’t have almond paste. (My macarons turned out OK, as will all be revealed, but the errors are all mine). Very neat that it actually works. (I tried the egg white version!) Do you have weights for the amount of almond paste/powdered sugar used? I was wondering if blanched whole almonds measured diferently, volume-wise, than slivered almonds. I don’t have weight measures, but I don’t think this one is really all that exacting. Whichever you use, I think you’d be fine. Thanks. One is pleased to be of service. I hope you like the results! I never buy almond paste anymore. Arriving late to this post, with a question.Is it possible that you didn’t like the boiled sugar version because the recipe is too sweet? The other versions had a stronger almond presence–relative to the sugar and syrup–which would change the texture, too. Other recipes for boiled sugar versions used less sugar, typically 2 c almonds to 1 c sugar plus 2 tb syrup, which is more like the ratio in your egg white not cooked version. I am guessing that the commercial preparations are also cooked, but I don’t know that for sure. Posters of other boiled versions gave the impression of authenticity, perhaps because that version is harder to make?. Since it is supposed to ripen for about a week, it’s impractical for last minute cravings, which leads to the egg white version. Just wondering, as I have never made either kind but am anxious to try King Arthur’s Almond Clouds without spending mega bucks on commercial almond paste…. Thanks for your comments. This post contains the sum total of my knowledge and experience of almond paste, so I’m not really sure about the sugar issue. It didn’t seem overly sweet to me. It was more the consistency and lack of strong almond flavor. They both worked well for baking and kept well in the fridge. Sara, marzipan is actually made from almond paste. In fact, some people consider it a form of almond paste. 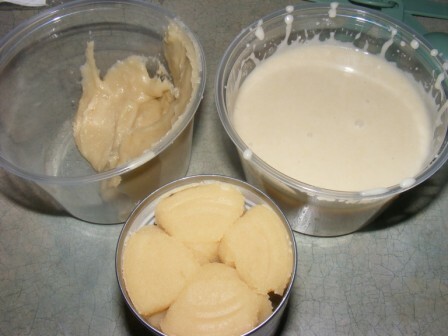 The almond paste sold in a can (which, as you note, is what this recipe is the equivalent of) is used in baking, being added to recipes as a flavoring. Marzipan is made by adding sugar to almond paste and is thus much sweeter than standard almond paste. Like fondant, marzipan is pliable and easily rolled, and is used for molding and decorating, rather than as a flavoring agent. Good to have the recipe right here where I can always find it. I did not make the corn syrup version after you said you liked the egg white one more, so it was very nice to be able to see the photo of all three of them together. I thought the egg white version was great, very fresh tasting as opposed to the canned one, which I opened to see…the canned one actually had a rather “tinny” taste to it, like the nuts had picked up the flavor of the can somehow (but that could be me as I have that going on with canned things quite often). I have to use that canned one up somehow as I tossed it into the freezer after I tasted it. Maybe cookies at Christmas time, certainly not for the crumb buns which are going to get the rest of my homemade paste. It was fun baking with you, and I learned a lot about almond paste! Thanks for trying both versions of the homemade and reporting…ever the researcher! I agree about the canned paste. It did have a tinny taste. I saved mine to use for something, though, as it’s too expensive to waste. I’m going to use the second batch of the sugar syrup version for the crumb buns, as I used all of the egg white batch on the scones (I made a small batch). I’m looking forward to baking with you again this weekend. I’m so glad you shared this recipe because I’ve always avoided recipes calling for almond paste because I can never find it. Now that I know how easy it is to make, I’ll definitely try this out. Thanks for the information. As always, very helpful and much appreciated! I had the same issue with almond paste. I couldn’t find it, and it was way too expensive to buy online. So I was glad to find these recipes and to realize how easy it was to make.